When we were asked to host the 5 th Congress of Asia Pacific Pediatric Cardiac Society (APPCS), we experienced mixed feelings of excitement and apprehension. This was going to be the first International event in the specialty of Pediatric Cardiology and Cardiac Surgery ever held in India. We had approximately two years for preparation of this prestigious conference. This landmark event was held at Hotel Le Meridian, New Delhi, in March 2014. The major challenge before us was to satisfy the scientific hunger of numerous delegates coming from diverse geographies, varied academic backgrounds, and vastly differing socioeconomic fabric of their countries. As has wbeen the trend in all major academic meetings across the globe, the nominations for organizing the 5 th Congress of APPCS to be held in 2014 were filed well in advance during the 3 rd Congress of APPCS held in Japan in July 2010. Interestingly, Indonesia, the other competing nation, was equally favored by the member nations during this bid. Therefore, the bid initially ended up in a tie. Hence, there was a re-bid, and we waited for the result with baited breath. Finally, after a long wait of more than a year, in November 2011, it was decided that India would host the 5 th Congress of APPCS. The Pediatric Cardiac Society of India (PCSI), which is a national society, then entrusted the organizing team from the Department of Cardiology, All India Institute of Medical Sciences (AIIMS), New Delhi, with the responsibility of conducting the 5 th Congress of APPCS at New Delhi. Soon after being assigned the role, we started working in this direction. Dr S Ramakrishnan, organizing secretary, APPCS 2014, set the ball rolling by convening the first meeting of the organizing team at AIIMS. Frequent brainstorming sessions ensued among all stakeholders, often at odd hours, as ideas started to sprout in people's minds. The preparations gathered momentum, and soon we started to breathe, eat and sleep APPCS 2014. All this while, it was heartening to see unconditional support from colleagues from India as well as from outside India. Giving due consideration to tropical climate in the Indian subcontinent and avoiding clashes with Indian festivals, the dates were chosen to be 6-9 March. Asia-pacific region is a heterogeneous group of about 20 countries with widely variable conditions in the field of pediatric cardiology and cardiac surgery, with most of the countries in this region belonging to the category of low- and middle-income countries; however, a few countries like Japan, Australia, New Zealand, Singapore, and South Korea are classified as high-income nations. The extraordinary diversity in economic status and human development indices presents a special opportunity for exchange and makes the APPCS a truly unique organization. With the realization of much needed emphasis on bridging the gap among member nations, "Translating recent advances to regional needs" was almost unanimously decided as the theme of the Congress. This phrase soon became the vision statement for all of us and guided us while preparing every bit for the Congress. Office bearers of member Asia-Pacific nations and senior mentors from these countries contributed in no small measure toward making this Congress of APPCS a huge success. In addition, the organizing team was overwhelmed by generous acceptance by various speakers within and outside Asia-Pacific region, thanks to the relentless work and utilization of personal resources by the senior members of the organizing team. Most of these eminent speakers agreed to attend the 5 th Congress of APPCS at their own expense, which gave us much needed financial buffer in the face of the global economic slowdown. This indicated the unconditional support we received from the global scientific community. The success of any scientific meeting is directly dependent on the number and quality of its delegate profile. Therefore, it was important to give it a wide publicity. No opportunity during these 2 years was left untapped for creating awareness about this upcoming 5 th Congress APPCS in India. The organizing team made presentations and distributed Congress's printed material in various international and national conferences such as 6 th World Congress of Pediatric Cardiology and Cardiac Surgery, annual session of AEPC, and local society meeting of Japan. Associations and professional bodies in member countries also pitched in this effort and disseminated information about the Congress to their members and other interested parties. Advancements in technologies and resultant ease of communication made this otherwise difficult task much simpler in the end. The large attendance by foreign and Indian delegates was beyond our expectations and is a testimony to the fact that we could reach to the large majority of expectant participants. 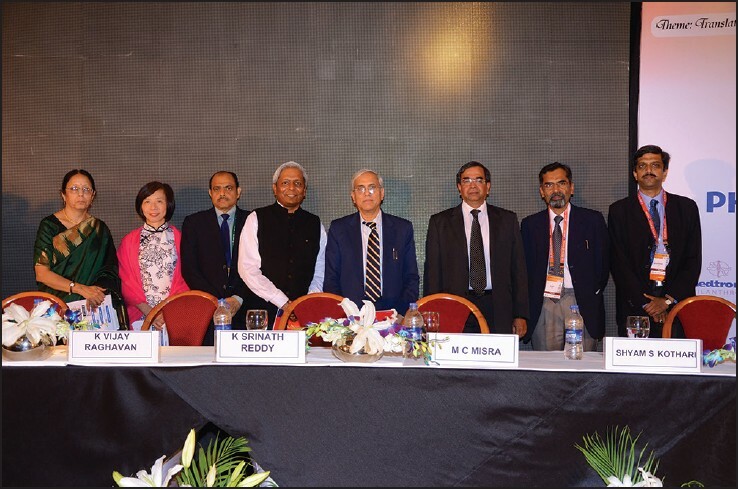 While we were excited by the newly found responsibility of conducting the largest meeting of pediatric cardiology in the region of Asia-Pacific, we were equally worried about the changing economic scenario worldwide. The prevailing signs were not very encouraging to say the least. Nevertheless, it seemed like an achievable task with generous support from the industry. The organizing committee worked on relentlessly to persuade other potential supporters including various governmental agencies. Other major contribution came from hospitals outside the government sector that are slowly adding much needed momentum to the pediatric cardiac care in India. The registration process and the fee structure were once again structured to provide maximum benefit to the trainees and younger members across the Asia-Pacific region. The benefits of concessional and early bird registrations were extended to all those who had their submissions of either oral or poster presentations selected, which, to our own mind, helped many younger colleagues. During the last lap of our preparations for the Congress, we suffered an emotional setback when we lost Professor Rajendra Tandon, fondly called as "The Father of Pediatric Cardiology in India." The contribution he has made in the field of clinical cardiology, especially in patients with congenital heart disease, is immense. In an attempt to show our gratitude to this great soul who offered his unconditional inputs and support to the scientific content of the meeting, the scientific committee decided to have the first "Rajendra Tandon Oration" during this meeting. In addition, Dr Tandon's legendary book on clinical cardiology "Bedside approach in the diagnosis of congenital heart diseases" was made officially available through the PCSI counter during the conference. After the long preparation phase, the bright sunny morning of 6 March 2014 heralded the beginning of the 5 th Congress of APPCS. The environment was vibrant with delegations from guest nations making to the reception desks. While most of the participants were pre-registered, many of them queued up for spot registration, with, contrary to our expectations, majority being foreign nationals. A total of 938 delegates attended this conference, including more than 400 foreign delegates. The delegates included professionals at various stages of their career. After the brisk business of registration, this rare mix of experienced and amateur professionals got down to the work, and the scientific sessions commenced on time at 9:00 am on 6 March 2014. The conference was formally inaugurated in the evening of 6 March. This ceremony began with the lighting of the lamp and a prayer "Saraswati Vandana" being offered to the Goddess of learning. The encouraging statements from the present dignitaries [Figure 1] underlined the need for greater emphasis on equitable distribution of health care. They exhorted the audience to strive for making advances in health care available to all, including those who are less fortunate. The inauguration ceremony was followed by a classical Indian dance recital by the eminent troupe led by the acclaimed Ms Geeta Chandran (Padmashree awardee). The performance kept the audience spellbound for an entire hour. The inauguration ceremony was followed by a sumptuous dinner, a part of hospitality Indians are known for. The scientific program of the conference exemplified highest levels of academics including path-breaking research and innovations to deal with abnormal hearts. The program was scheduled in such a manner that delegates had enough time to network with each other and to view posters and exhibits, an integral part of the scientific schedule. With ever-increasing advancements, the role of interventional cardiology has expanded tremendously in the last two decades. The interventional cardiology workshop in collaboration with 3 rd meeting of i-FISCH (Interactive Forum for Interventions in Structural and Congenital Heart Disease) was conducted over the first two days of the Congress. This highly popular meeting was attended by more than 450 delegates and 200 faculty members. The academic content of the meeting was rich, with a much needed emphasis on the basics. The meeting included live transmission of 12 cases from 4 geographically dispersed centers in India. Excellent quality of video and audio made the participants feel as if they were with the operator in the catheterization laboratory. While faculty performing live cases did a fabulous job, the halls were kept alive by real-time interaction and discussion with operators, panelists, and, more importantly, audience. The sessions included not only how to do interventions but also lessons learnt from complications, an integral part of interventional cardiology. Workshop of pediatric cardiac surgeons was equally well attended by colleagues from surgical specialty. The content once again was rich and comprised "How I do it" and "What to do and what not to do" sessions. Well-known names in the field of pediatric cardiac surgery enlightened audience about common surgical issues like repair of atrioventricular septal defect and exceedingly complex issues like "extra-cardiac Fontan without grafts" and "transplant in complex anatomy." The workshop on cardiac imaging revolved around complementary and integrating role of various imaging modalities. The idea was to define strategies for surgical repair of common, yet complex, anatomic subsets like atrioventricular septal defect and double outlet right ventricle with doubtful routability. The sessions had a balanced mix of instructive talks and illustrative cases. In addition, sessions were dedicated to upcoming tools like functional cardiac MRI and 3D cardiac printing. In another first, a workshop on pediatric electrophysiology was conducted during this Congress. With a robust scientific content to boast, this workshop was equally well attended. The topics discussed ranged from "Basic cardiac anatomy for electrophysiologists" to more complex issues like "Tachyarrhythmias in corrected transposition of great arteries" and "Infected pacemakers in children." The plenary sessions saw some of the world's best minds deliberating on contemporary problems faced by cardiac professionals globally. The plenary sessions focused on current dilemmas such as "Appropriateness of catheter interventions" and concerns of modern day cardiac surgeons such as "Rapid change in strategies in cardiac surgery." 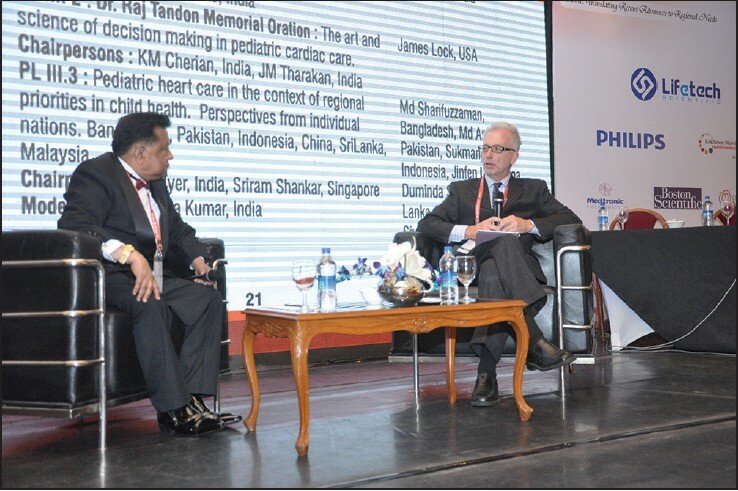 Audience were taken for a journey of pediatric cardiac care over the past 5 decades while being equally engaged by the concerns shared by experts over neurodevelopmental outcomes after repair of congenital heart disease. Dr. Raj Tandon Memorial Oration, a fitting tribute to the legend, was delivered by James Lock on "The art and science of decisionmaking in pediatric cardiac care." This oration would become a regular feature of PCSI annual meetings in the years to come. Another living legend, Dr. KM Cherian shared his journey of pediatric cardiac surgery with the audience while being interviewed by another famous surgeon, Tom Carl [Figure 2]. While plenary sessions were highly academic, the focus from regional assessment of pediatric cardiac care was not lost. A full 1-hour session was scheduled to discuss perspectives from diverse member nations from Asia-Pacific region. The conference program was comprehensive, covering every facet of pediatric cardiac care, and this was readily evident from a brief glance at the program. Some clinical scenarios that are of special relevance to Southeast Asia, such as "Late presentation with transposed great arteries and intact ventricular septum" and "ICU challenges in resource-limited setting" were taken up. These sessions were designed in formats best suited to the clinical scenario in question, and ranged from case studies, to lectures, to panel discussions. The majority of such focused sessions caught the fancy of the delegates and the faculty members equally. This was a rewarding experience for the organizers. As mentioned earlier, a large number of abstracts and interesting cases were presented during the Congress, mostly by fellows in training. To encourage quality research, the scientific committee constituted a total of 15 awards for best research under various categories, including basic sciences. The two awards for "Best abstract in interventions" and "Best surgical abstract" need special mention. The winners in these 2 categories were awarded with 3 months fellowship in one of the best centers in South Korea. 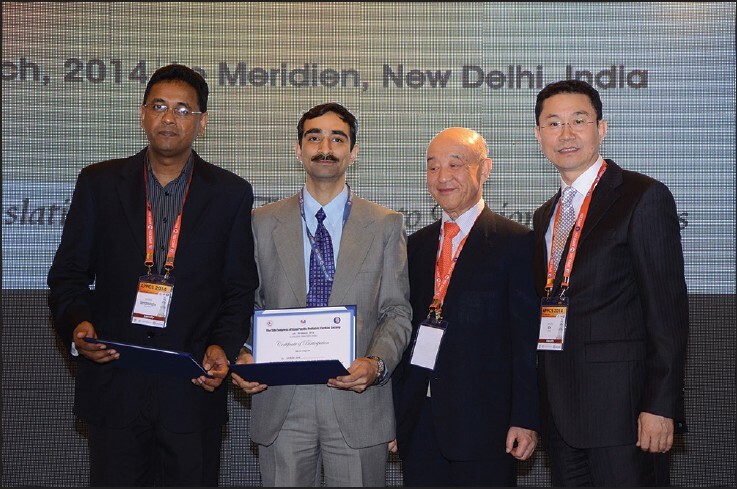 Both these awards were sponsored by Neurovascular Research Foundation, Sejong General Hospital, South Korea. Dr Park, founder of Sejong General Hospital, gave away these awards to the winners [Figure 3]. The award ceremony was held on the eve of the last day of the Congress during the gala dinner where all winners were felicitated by eminent seniors in a festive environment. The APPCS, having representation from more than 20 countries, is undoubtedly a great platform for interdisciplinary and international collaborations. Justifying this very principle of the meeting, we had joint sessions with Association for European Pediatric and Congenital Cardiology (AEPC) and Asia-Pacific Society for Adult Congenital Heart Disease (APSACHD). In addition, this opportunity was utilized by the country office bearers from various societies to have business meetings of their societies during the conference. The tremendous improvements that pediatric cardiac care has undergone would not have been possible without the dedication of nursing professionals. With increasing complexities in the treatment modalities, be it intervention or cardiac surgery, their role has attained a vital position in the current era. Recognizing this fact, APPCS in association with Children's HeartLink, an international non-profit organization, organized a 2-day dedicated session for nursing professionals. The program targeted improvement in nursing skills as practiced in resource constraint settings prevalent in many countries in the Asia-Pacific region. The organizers are deeply indebted to Ms Bistra Zheleva of Children's Heart Link for shaping the program and for sponsoring and organizing this event. The scientific committee designed a large number of breakfast and lunch symposia on all days of the Congress. Pharmaceutical and other medical industry came forward to support this endeavor generously. These sessions generally catered to fellows in training, but were attended in large numbers by other professionals, at various stages of their career. Breakfast sessions, which started at 7.30 am, included topics such as "ECG in congenital heart disease" and "Arrhythmias" to "Challenges in cardiac surgery" and "ICU challenges unique to Asia." The organizers were pleasantly surprised to find rooms filled with delegates even at an early morning hour and during lunchtime. These sessions were highly interactive and consequently very educative for most delegates and panelists. A large area at the Congress venue was earmarked for industry exhibition. A total of 21 stalls were put up where the industry could showcase their latest products. We ensured that a large number of delegates were able to visit the exhibition by having these stalls on the way while going to have their lunch and dinner. The anxiety that we had at the commencement of the meeting was soon to fade away, thanks to the more than expected support from friends and colleagues from all over the world. By the time we reached the end of the meeting, a sense of serenity enveloped our hearts with the realization of having accomplished the 5 th Congress of APPCS successfully. The true success of the meeting, however lies, in the realization of the dream of "Translating recent advances to regional needs" for the benefit of the children with heart diseases in all parts of Asia-Pacific region. At the end, we thank all the delegates and faculty members whose contribution made this conference successful. Thanks are also due to all members of the organizing committee for their continuous and untiring support. We would like to extend our best wishes to Dr. Sun Kun, organizing secretary for the 6 th Congress of APPCS, which is to be held in Shanghai, China, in February 2016. Moodie D. National Cardiac Meetings: What's wrong? Congenit Heart Dis 2013;8:1-2. Ann Pediatr Cardiol 2014;7(suppl 1):s1-135.